The default embed type is the iframe. This is recommended for most users, and means that any improvements we've made to the underlying code are automatically reflected on your site. We would suggest that, unless there is a compelling technical reason preventing you from using the iframe, you only use the iframe for embedding. Click the 'Copy to Clipboard' button and now you can paste the code to anywhere that accepts HTML, for example, the HTML source of a web page in a regular text editor, a "web content" or HTML widget in a website editing service like Squarespace, etc. Note: If you are pasting the embed code into a Content Management System, make sure that the CMS does not modify the HTML code. There is usually a method of pasting the code into the CMS without it 'interpreting' the HTML. Sometimes a well meaning CMS breaks the code. One final note - you may find that, especially if you're using a site-builder app. like Squarespace or Wix, your video may not appear in draft/editing mode - you may have to save your changes and publish the page to your site in order to see the video in the video player. 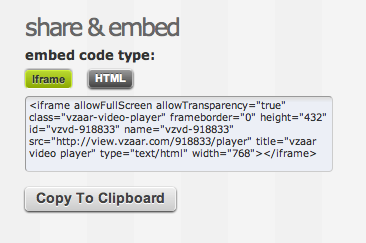 Related reading: Embedding a video in a Wix site. With viewers using all kinds of different devices to view web pages these days, many websites use 'responsive web design' to ensure that their web pages look great regardless of the device the viewer is using to view. <iframe id="vzvd-1152805" name="vzvd-1152805" title="vzaar video player" type="text/html"
There are many approaches to responsive design. You may be using a framework (e.g. Bootstrap) which handles all aspects of responsive design for you. You may have your own in-house approach or you may be relatively new to responsive design.